When you need replacement cones for crushing equipment quickly, count on Star Mesh. We stock a large number of replacement cone castings for most crushing equipment, or we can custom manufacture our cones to your specifications within one week of receipt of an order, so you’ll get what you need fast with minimal downtime. If you need a replacement cone for your crushing machine that can withstand the toughest conditions, then you need Star Mesh’s manganese cones. 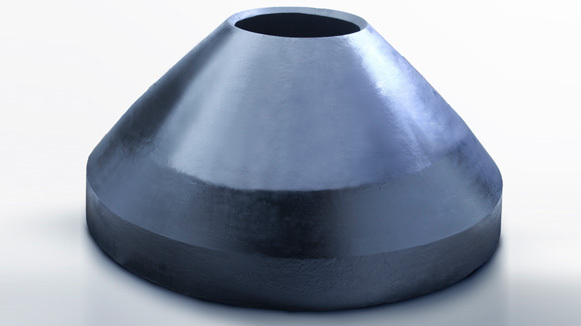 Our replacement cones feature manganese in three grades depending on the crushing conditions encountered – 14 percent, 18-19 percent, and 21-23 percent. Star Mesh’s replacement cones offer excellent wear life and fit and go through a rigorous quality control process. What’s more, we manufacture our cones to your spec within one week of receipt of an order, so you’ll get what you need fast with minimal downtime. Not to mention, we stock a large number of replacement cone castings for most crushing equipment – which means we’ll likely be able to get your order to you – fast. Star Mesh will custom design your replacement cone to your exact specifications. And, our replacement cones are designed with the toughest applications in mind, such as the crushing of mid-hard and above mid-hard rocks and ores. With Maxwear™ wear surfaces, our cones are heavy-duty built for high productivity, easy adjustment and lower operational costs. Downtime is costly, which is why we work hard to make sure you receive your replacement cones quickly. We never compromise on quality, because it’s important to us that our customers are able to get back to work in the shortest time possible. We can manufacture your replacement cone crusher to spec within one week of receiving your order, and we stock a large number of replacement cone castings for most crushing equipment.